Behind the French Menu: Saint-Pierre, that unique fish. 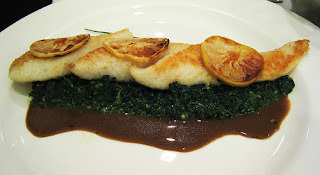 John Dory in French Cuisine. Searching for the Most Popular Fish in France. St Peter’s Fish, John Dory. Saint-Pierre, San-Pierre – John Dory, St Peter's Fish. 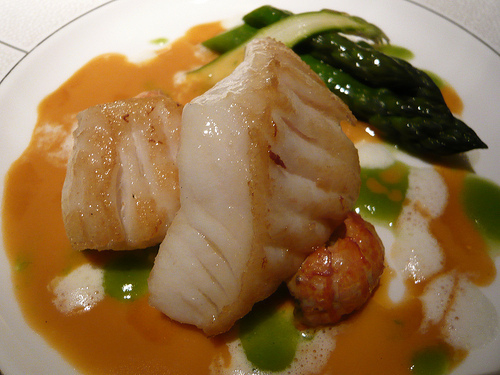 Saint Pierre is a firm, tasty, white-fleshed sea fish, and one of the most popular fish in French fish restaurants. There many dishes where this popular fish will be offered smoked, sautéd, grilled, poached and or baked as filets. These fish are caught at sea, not grown in fish-farms, and can be quite large, often over three kilos (6.6 lbs). 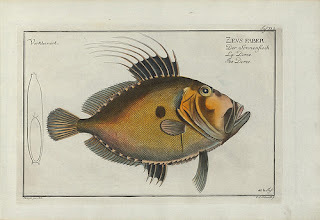 A drawing of John Dory from between 1782-1795. The mark on the side of the fish was thought to be St Peter’s thumb print. The English name John Dory comes from the French Jaune Dore, meaning golden yellow, and that is this fish's color when freshly caught. The French names Saint-Pierre or San-Pierre refers to the mark on the side of the fish that looks like a thumb print. With that mark, some European traditions taught that this is the thumb print of St Peter. St. Peter was a fisherman before becoming the leader of Christ’s Apostles. Unfortunately, for this particular tradition’s creator the real St Peter, the fisherman, was a fresh water-fisherman and the John Dory is a salt-water fish. St. Peter never fished in the Mediterranean or Atlantic. Problems with historical traditions do not, however, interfere with the excellent taste of the fish. Aiguillette de Sainte Pierre Poêlée, Réduction au Vin d'Irancy Monté au Beurre – A slice of John Dory lightly fried in a butter sauce prepared with the red wine from the appellation Irancy, Burgundy. The red and rose wine vineyards of Irancy AOC are about 15 km (9 miles) from the vineyards around the town of Chablis so famous for its white wine. Both wines come from the department of Yonne in Burgundy. Blanc de Saint Pierre Rôti au Beurre Noisette, Betterave Caramélisée au Miel – A filet of John Dory roasted with a noisette butter sauce and accompanied by beetroot caramelized with honey. (Beurre noisette is butter that has been slowly heated until it achieves its hazel nut color and a lightly nutty taste). Filet De Saint-Pierre Au Beurre Blanc – A filet of John Dory prepared with a white butter sauce. This sauce is also called Sauce Nantaise after the city of Nantes which is credited with its creation. John Dory with roasted lemon on a bed of spinach. Filet de Saint Pierre Sur Lit de Poireaux et sa Sauce Crémeuse au Citron - Filet of John Dory served on a bed of leeks accompanied by a creamy lemon sauce. Saint Pierre aux Ormeaux, Beurre d'Algues de Chez Bordier – John Dory prepared together with the meat of the abalone, the sea snail, and a butter made with the addition of a local seaweed. The French have been using the treasures of the sea, including seaweed, for as long as the Japanese. St Peter was a fisherman who worked in the freshwater lake, the Sea of Galilee; called the Lake Kinneret in Israel. The fish St Peter would have caught 2,000 years ago, was a freshwater fish and that same fish is still caught wild in the Sea of Galilee where it is called St Peter's Fish or more accurately the mango tilapia. What would have surprised St Peter today is the number of fresh-water fish farms in Israel, and in another fifty countries around the world, that also farm this fish along with other members of the tilapia fish family. The freshwater St Peter’s Fish, the Mango Tilapia. Froese, R. and D. Pauly. Editors. 2017. FishBase. World Wide Web electronic publication. www.fishbase.org, version (06/2017). Enjoy Saint-Pierre, John Dory, in France, and in other European countries. 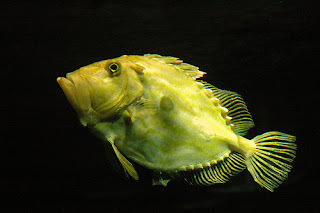 Enjoy the same fish by the name John Dory in North America and the UK. When visiting Israel enjoy the original, fresh-water, St Peter's Fish, the Mango Tilapia. (Cataln – gall), (Dutch - zonnevis ), (German - Peterfisch), (Italian –pesce San Pietro), (Spanish gall, gall de San Pedro). Aiguillette on French Menus. Aiguillettes are Slices and the Word Describes How a Dish is Served. Algue or Algue de Mer Seaweed, Edible Seaweed. Algue or Algue de Mer on French Menus. Asperges en La Cuisine Française – Asparagus in French cuisine. The Artists who Painted Asparagus or Lived Near Argenteuil. Chablis; One of France's Finest White Wines and Chablis the Town. Langoustine – The Dublin Bay Prawn, Scampi or Norwegian Lobster on French Menus. Behind the French Menu’s links include hundreds of words, names, and phrases that are seen on French menus. There are nearly 400 articles that include over 2,000 French dishes with English translations and explanations. Add the word, words or phrase that you are searching for to the words "Behind the French Menu" and search with Google or Bing.